Enduring 18 holes outdoors can definitely be a struggle during the Summer in the Myrtle Beach area. With humidity at its peak and temperatures high, it's not out of the question that a Summer golf trip might mean sweating through temps in the upper 90s. Eliminate the stress of putting your body through these extremes by booking your Myrtle Beach golf getaway for the Fall. Autumn brings about bluer skies, beautiful changing leaves, and cool sea breezes, and you can experience it all with a Fall stay in one of our charming vacation rentals. With your own private balcony or patio, you'll get to take in all of the sights and sounds of the area while you relax after a long day on the links. With the Fall and Spring seasons being the peak time of year for golf excursions, these are generally the times when courses and clubhouses are in their best shape. Grounds are well-kempt in preparation for the onslaught of visiting golfers, and most renovations have been completed by this time. You will love stepping onto the links and seeing everything in proper order. And with dozens of courses to choose from, you're sure to be impressed no matter which one you decide to tackle. Although the hustle and bustle of summertime can be fun, your golf vacation in Myrtle Beach will be much more relaxed in the Fall, when families return to work and school, and the beaches grow more tranquil. With fewer visitors, you can bet on better traffic and less congestion when it comes to getting around the Myrtle Beach area. With less cars on the roads, there will be fewer accidents and incidents, and you can truly focus on your golf game without worrying about the extra headaches related to travel. 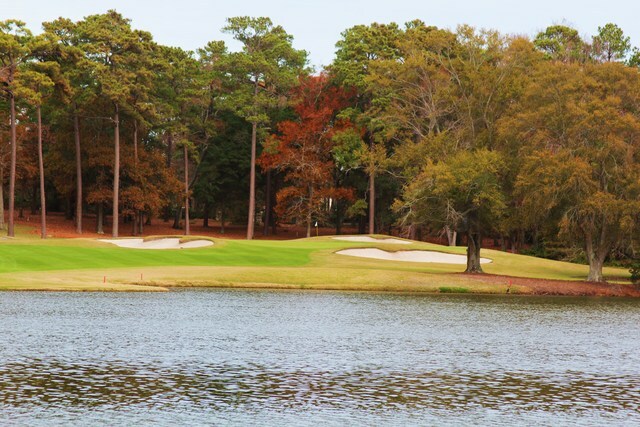 If you love Myrtle Beach but prefer the beach city when it's a little less hectic, then reserve your Fall golf escape today! It's not uncommon for many of our golf vacationers to meet up with large groups of colleagues, friends, and family members from all across the country during their Myrtle Beach golf excursions. With the kids back in school, your Fall golf trip gives you the freedom to mix and mingle with all of your golfing buddies from years past, as well as give you the opportunity to make even more connections. There's nothing like the exhilarating feeling of clearing your mind and focusing on your game while on vacation. Spend some time with your friends on the links during your Autumn getaway. While it might be easier to get time off in the Summer, the best prices and special packages are available during the Fall! From lower flight tickets to less expensive accommodations, there is no time like Autumn to save money on your Myrtle Beach vacation. With many locations offering stay-and-play deals, you are sure to get the most bang for your buck when you visit during the cooler months of the year. Be on the lookout for fantastic savings when you reserve your golf excursion with us!